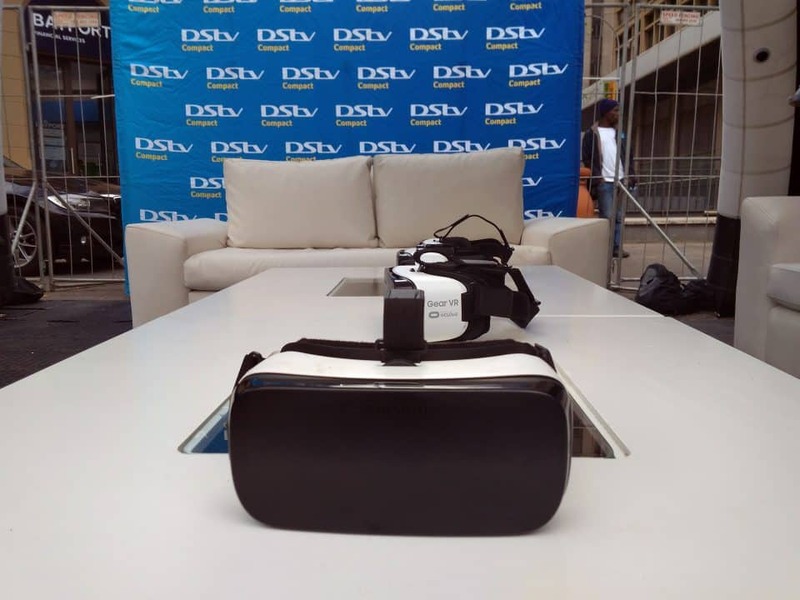 We developed a Virtual Reality experience for DSTV to promote their DSTV Now and DSTV Box Office services to new and existing clients. 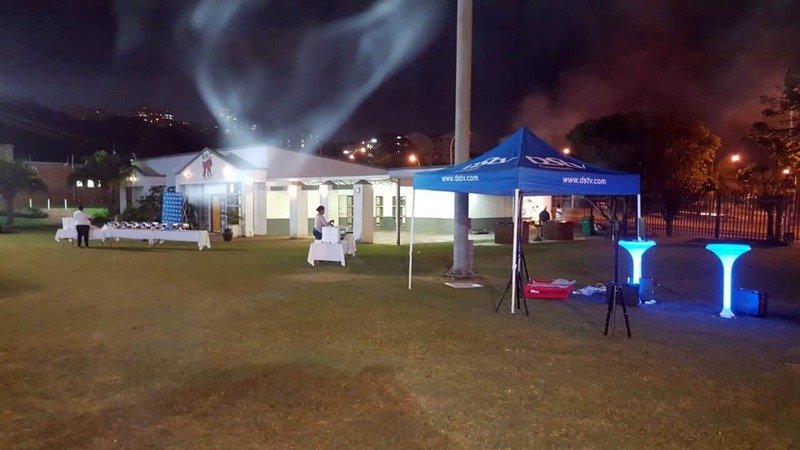 We used the high-end HTC VIVE virtual reality system as the technology to showcase the experience to clients. 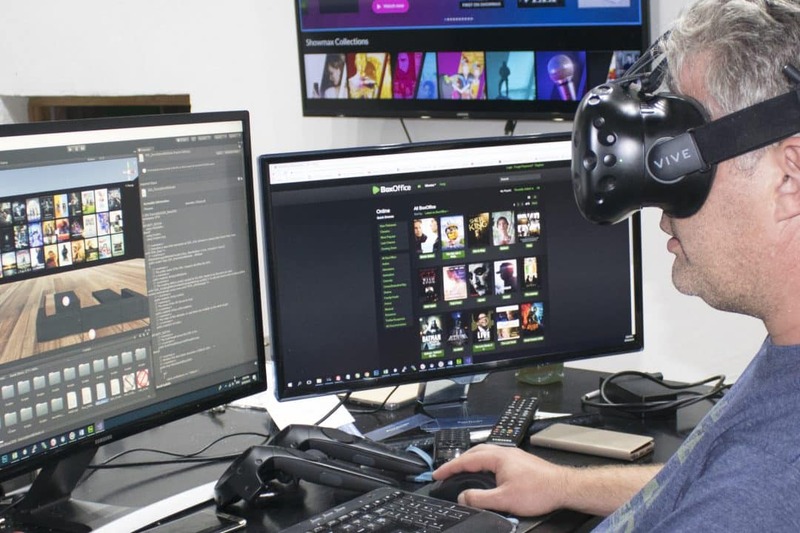 The HTC VIVE Virtual Reality system is a high-end virtual reality device that allows people to experience room scale virtual reality. In simple terms people could walk around inside the virtual reality experience and the HTC VIVE sensors monitored their body movements inside virtual reality. 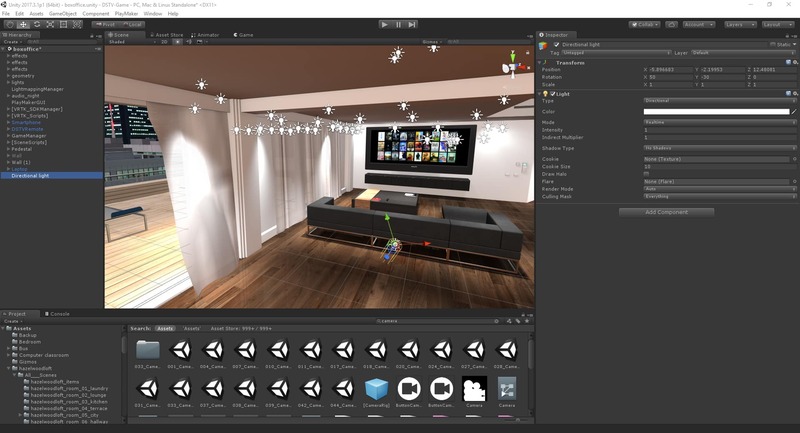 This system allows people to pick up stuff in Virtual Reality and interact almost similarly with real objects as if they were touching them in real life! 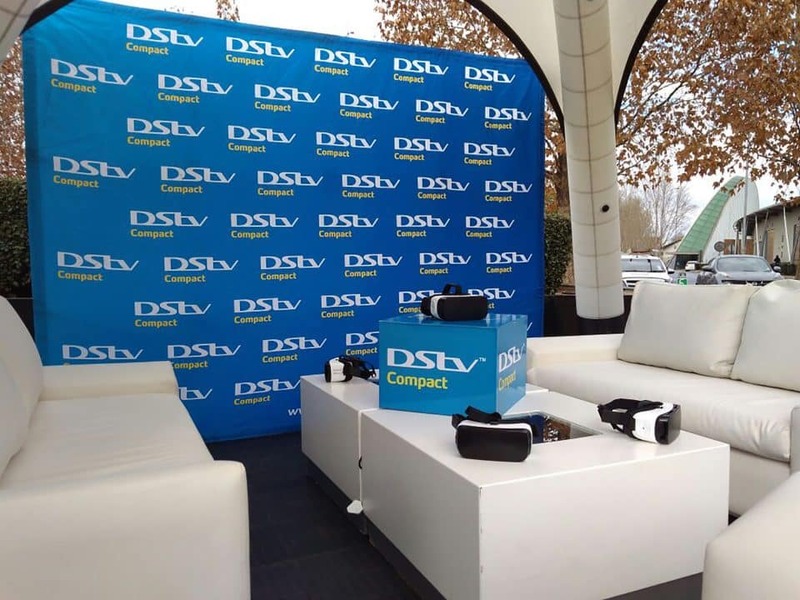 In the DSTV Virtual experience the customer is immersed into an big room. On the one side of the room there is a huge video wall displaying all the movies that were on DSTV Box Office for the month during which the campaign ran. On the left side of the gigantic video wall there was a BIG Screen almost like a cinema screen on which the customer could view the Box Office videos. The virtual reality game started with the player standing in the middle of the room. Around the player was a comfortable couch and in front a table with a DSTV remote on the table. The player / customer needed to pick up the remote and point it to the Gigantic Video wall and pick one of the movies that they wanted to watch on the big screen. We made this very simple to allow anyone entering VR for the first time to experience the awesomeness of Virtual Reality without making it to complicated. The reactions from people trying VR for the first time, especially high end virtual reality like the HTC VIVE remains priceless. Depending on how busy the activation got, people could either watch one movie in this Gigantic room, or they could watch more than one trailer of the Box office movies on the big screen. 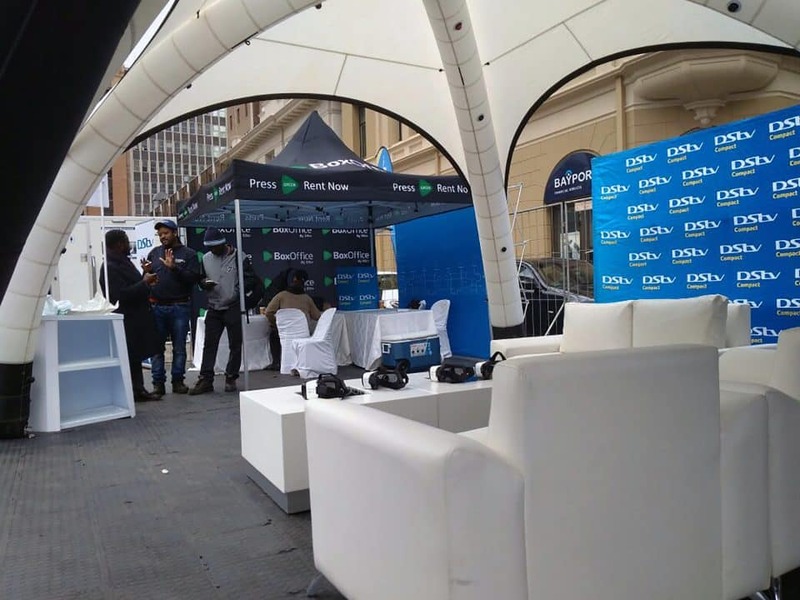 At the activation’s we had an activation specialist assisting people to get into the VR experience and to guide them through the VR experience, but to also monitor the crowds and allow people to experience the awesomeness for themselves. As a bonus to the Gigantic Room, and also to showcase Virtual Reality and to wow clients, we also added some stuff to do inside the room. 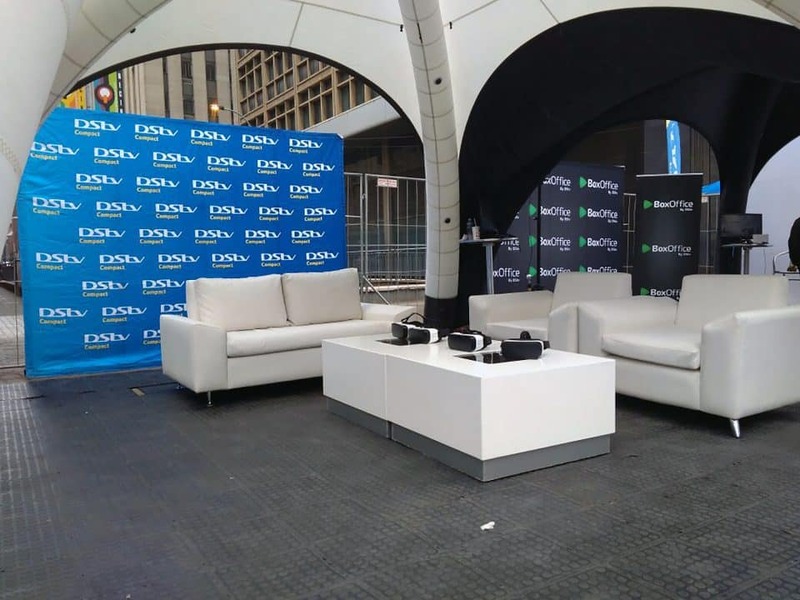 Players could move around “Teleport” inside the DSTV room and on the one side of the room there was 5 pedestals each one with a device on it, on which you could watch DSTV Now and DSTV Box office in virtual reality. Advertising one of the KEY elements that DSTV wanted to promote, that you can watch DSTV anywhere on a multiple of devices. These devices included a Laptop, Smartphone, Television, Tablet and Computer. 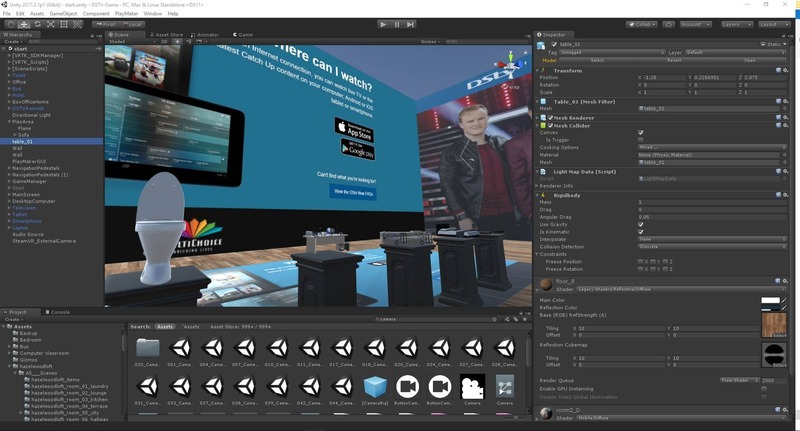 The awesomeness of the experience was that clients could pick up the devices in Virtual Reality and use the HTC VIVE controllers to interact with the devices and select box office trailers from the device and watch it in VR inside the device. To make the concept more fun and engaging we developed 5 x more engaging experiences catering for the more advanced users, and to further make the experience more engaging. 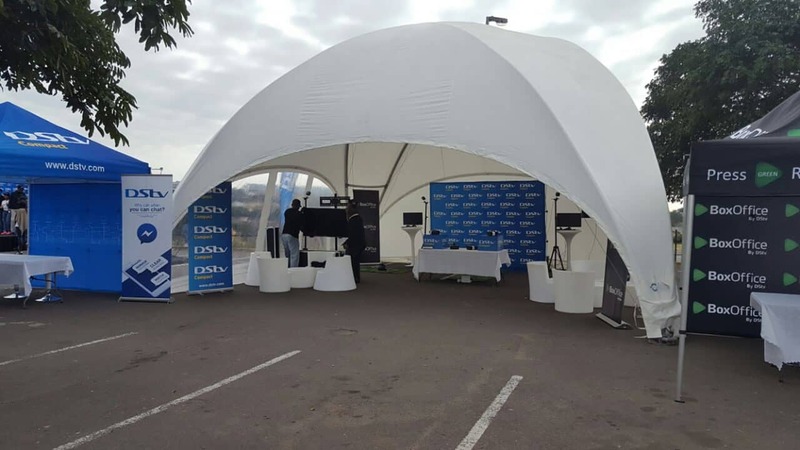 DSTV wanted to showcase that you could watch DSTV Box office literally everywhere. Inside the gigantic DSTV Box office room we placed 5 x pedistals on the other side of the room. On each of these pedestals there were small models placed symbolizing the experience which you could have if picking up the object and teleportation to that world / scenario. The concept “You could literally watch DSTV Box Office” anywhere. 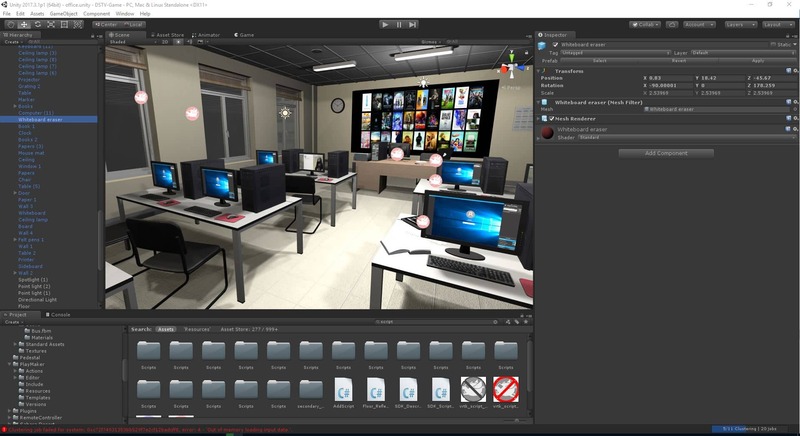 In this experience you were teleported into a school class, where you start behind the teachers table. In the room the client could explore the room and walk around in the classroom as if it was real. In the room was the 5 x Devices on which you can watch DSTV Box office and DSTV Now. In the school / office at work experience the message was relayed to the player that they could watch DSTV Box Office anywhere. We created a virtual reality city for this experience. 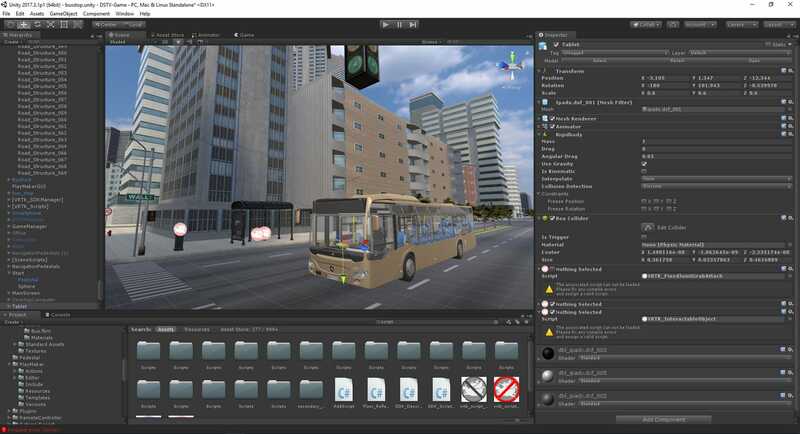 In this experience the client starts at a bus stop, and in front of the client was a bus. The bus stop had some strategic placed DSTV signage on it, to relay the clients message. One of the biggest advantages of using Virtual Reality in Marketing is the fact that you are in complete control of what your clients see. 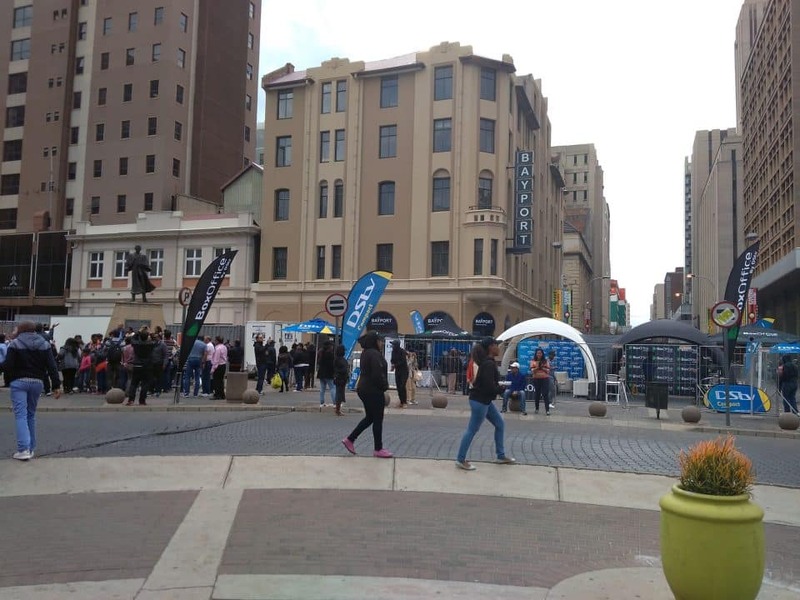 In this experience the client could get onto the bus, walk around the city and pick up one of the 5 x devices and watch a DSTV Box office movie trailer on the device. On one of the pedestals there was a house. If players picked up the house from the pedestal and pulled it to their faces, they were transported to a penthouse. 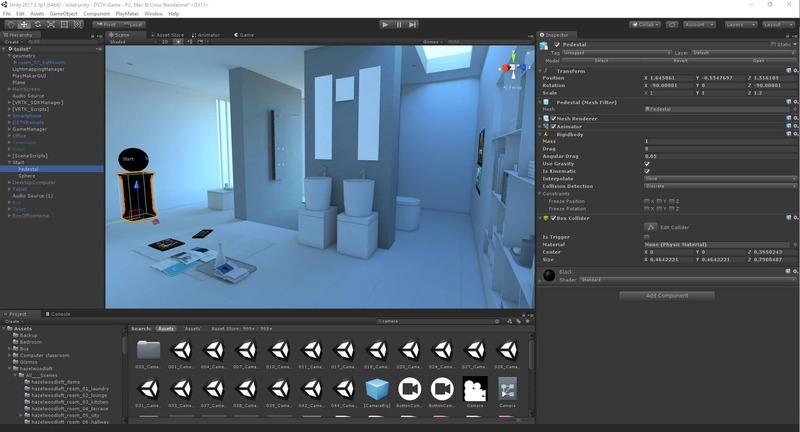 The client could explore the penthouse and walk around it and experience the awesomeness of virtual reality. They could also watch DSTV Box office trailers inside the house on various televisions in different rooms of the house. 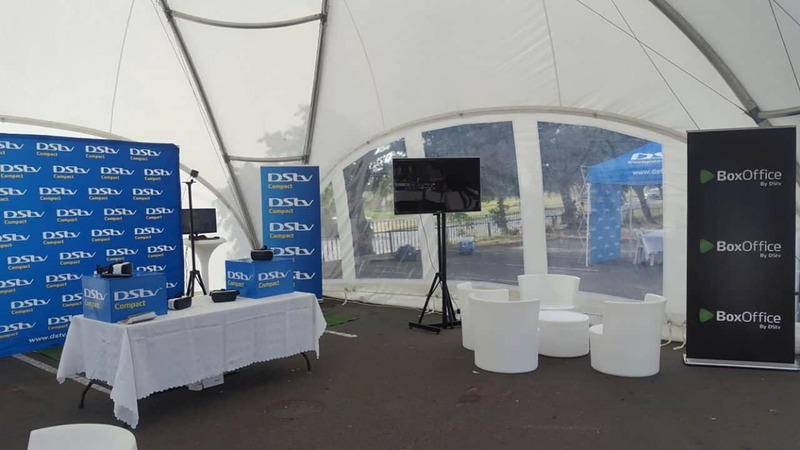 We also placed the 5 x Devices on which you can view DSTV NOW and Box office around the experience, on which they could then watch the trailers. This experience showed how if you were living with other people in the same house, they could all watch what they wanted where they wanted using one of the devices. 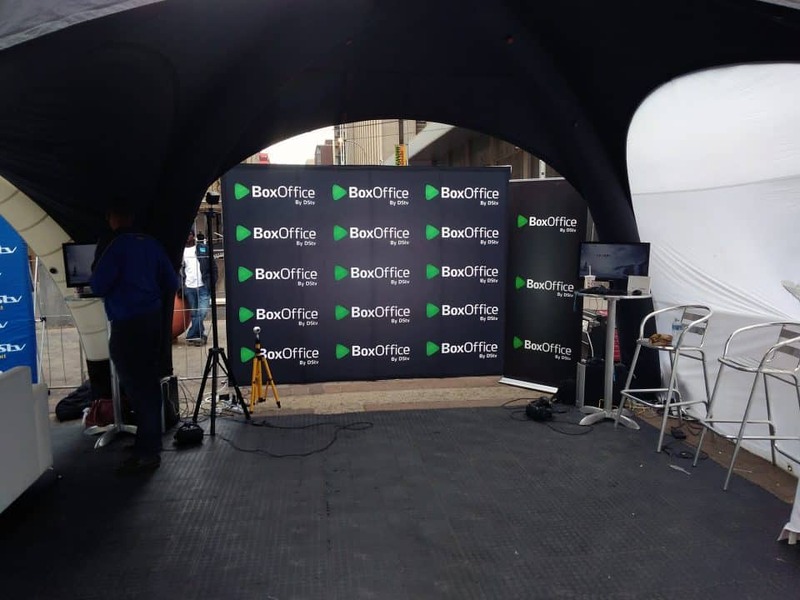 To further demonstrate the versatility of Box Office and DSTV Now the client thought that it would be funny to bring in some humor into the experience. In this scenario the player pulled the toilet into their face and were transported into a bathroom. Inside the bathroom / toilet the player could watch Box Office or DSTV Not trailers inside the bathroom. 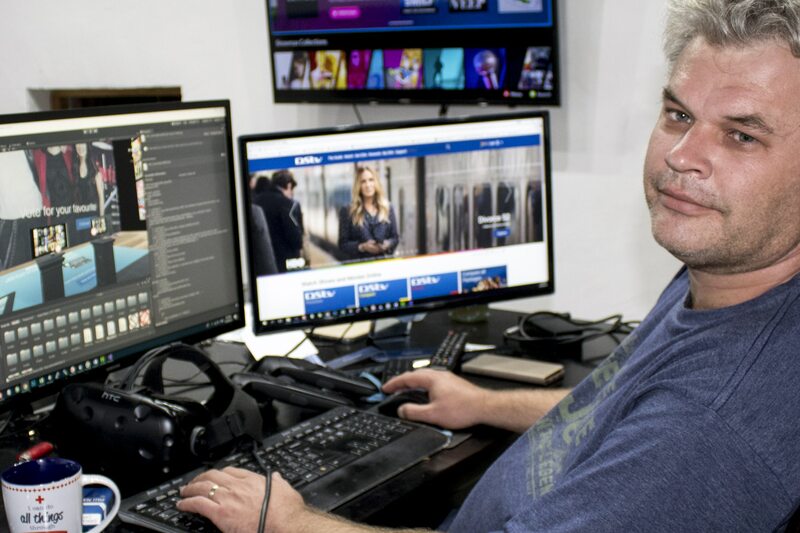 We were on a tight deadline to complete the DSTV Box office virtual reality and had to work overtime to get the project completed in 2 weeks.